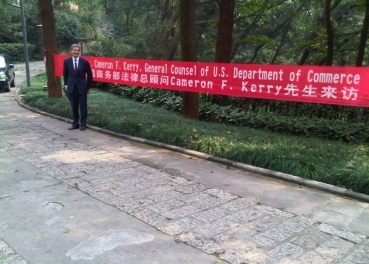 On Monday, October 18, 2010, General Counsel Cameron Kerry and Vice Minister Chong Quan opened the 2010 US-China Legal Exchange in Hangzhou, China. The General Counsel and Vice Minister emphasized the importance of a frank and open exchange of ideas; the opening day certainly met that standard. Courtney Gregoire, Director, National Export Initiative, International Trade Administration, offered a presentation on the Commerce-led National Export Initiative. John McInereny, Chief Counsel, Import Administration and Albert Hsu, Chief Economist, Import Administration, offered several presentations on the procedures and application of US Anti-Dumping and Countervailing Duty (CVD) law. The Chinese delegation offered comments and posed poignant questions. In addition to an extremely productive Legal Exchange, General Counsel Kerry was warmly welcomed at Zhejiang University where he addressed and interacted with a group of law students and professors. Tomorrow, the US delegation moves on to Wuhan for the second stop on the Legal Exchange before concluding in Chengdu on Friday, October 22, 2010.